Vision Statement: To prepare the way for a safe future through effective partnerships that will protect our community from the impact of disaster and loss of lives. Mission Statement: To offer professional mitigation, preparedness, response and recovery services that reduces the impact of disaster, injuries, economic losses, loss of lives and enhances the speedy recovery from these disasters. The Eden Emergency Squad, Eden Volunteer Fire Department, East Eden Volunteer Fire Department, and the Eden Town Hall are compiling a data base of the town residents who are on any type of in-home life support, for example, in-home oxygen or dialysis, etc. This information will be on hand for these organizations in the event of a disaster in our community. All information is strictly voluntary and will be kept confidential. 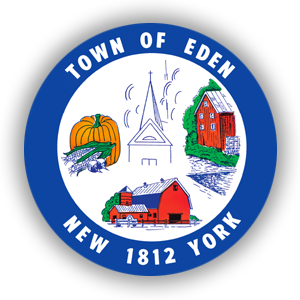 We ask that any member of a household fill out the “Town of Eden Emergency Response Form” and return it to: Supervisor’s Office, 2795 E. Church St., Eden, NY 14057. If you have questions, call the Eden Police Department at 992-9211. Learn what disasters are most likely to occur in your area. Request information on how to prepare for each. Find out how to help the elderly, or disabled persons, if needed. Be a Good Neighbor, and help one another. Make plans for childcare in case parents can’t get home. Meet with all members of your family and discuss a plan where to meet should a disaster occur. Discuss what steps will be taken for evacuation. Plan how to take care of your pets. Teach children how to dial 9-1-1.